I originally posted this article last Mother’s Day, but it’s still totally relevant. I’m headed down to Philadelphia this weekend with my sister, mother and aunt to visit our grandmother/mother at her retirement community. This place does a crazy-good mother’s day buffet. They have everything. I’m talking every breakfast food imaginable. Including roast beast. We’re finishing up the first week of the Spring Nutritional Reset, but I’m not worried about food choices over the weekend. Breakfast is one of the easiest “out” meals to do. Lots of eggs, veggies and some bacon. In past years I might have done unlimited bacon, but given that I’m not sure of the quality of the meat, I’ll probably just go for a slice or two instead of eight. A special holiday is coming up this Sunday. A holiday to celebrate that special lady that brought you into this world. The special lady that nourished your body and mind and nurtured you into adulthood. Sunday is a day to celebrate mothers! How will you celebrate your mother? By giving her a gift? By going out to a meal? I know how I usually celebrate my Mama: by paying my annual visit to an all-you-can-eat brunch buffet. Why is it that buffet brunches are associated with Mother’s Day? Why does brunch food have to taste so darn good? 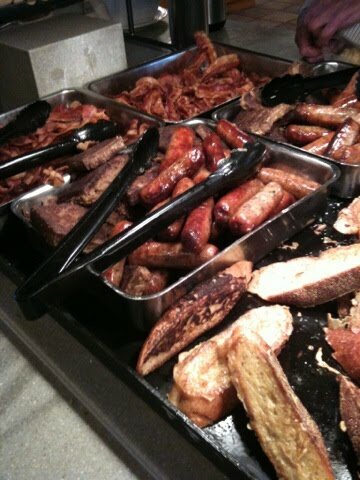 I have to admit that I am a sucker for a never-ending pile of bacon and I know that I am not alone when I say that I have less than stellar willpower when faced with a trough of sausages and an omelet station. 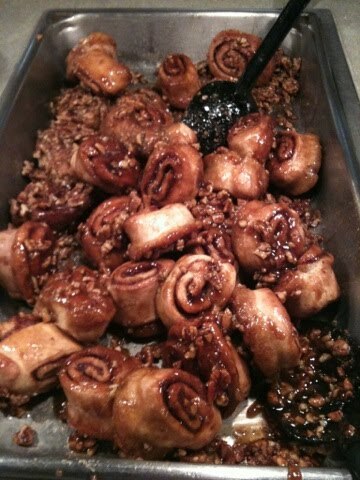 If you are one of the many people who have mixed feelings about encountering the buffet, have no fear! You are definitely not alone. Buffet settings do not lend themselves to sensory specific satiety, which is when our taste buds get bored with the repetition of eating one flavor over and over. You are less likely to overeat if your only option is scrambled eggs than if you are presented with eggs, toast, bacon and fruit. If we put four or five different types of food on our plate, we will naturally eat more because it will take longer for our taste buds to get numb to the variety of flavors. Survey the scene before your pick up your plate. Before you even touch a plate, do a walk through of the buffet. Check out what kinds of foods are available and find your favorites: the ones you absolutely don’t want to miss. If you make sure that you see everything before you grab a plate, you’ll be less likely to go back for thirds to fill up on the foods that you missed. Choose your favorite foods from the entire buffet and focus on those first. Crowd out the not-so-healthy choices. 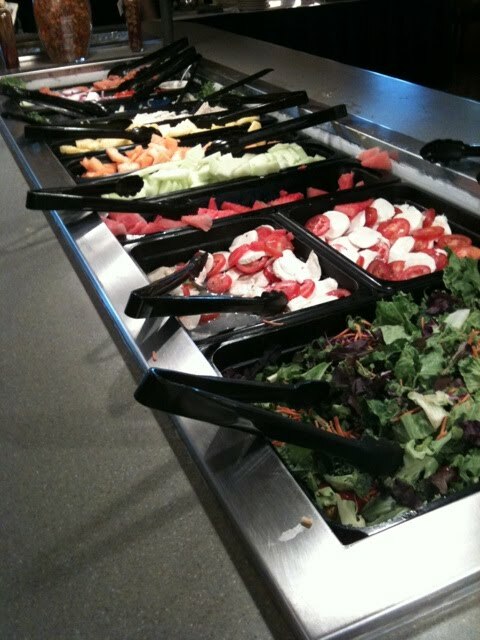 On your first trip to the buffet, fill half of your plate with a healthy option: cooked vegetables, mixed greens or fresh fruit. Eating the healthier foods first might help you to avoid overeating the not-so-healthy foods. Choose only two flavors each time you fill your plate. Each time you visit the buffet, choose only two types of food. If you cut back on the variety of foods on your plate, your taste buds will be less stimulated and more likely to reach sensory specific satiety. Focus on your company rather than the food. If you are going to a brunch buffet this Sunday, you are most likely at this buffet to celebrate someone (your mother), so why not focus on her instead of the unlimited supply of cream cheese danish? Focusing on loved ones and engaging them in conversation is more fulfilling and satisfying than a huge plate of bacon any day. If you take these tips into consideration, you are sure to avoid leaving your table uncomfortably full. You will have taken advantage of your favorite foods, but not eaten so much that you are uncomfortable in your own skin. 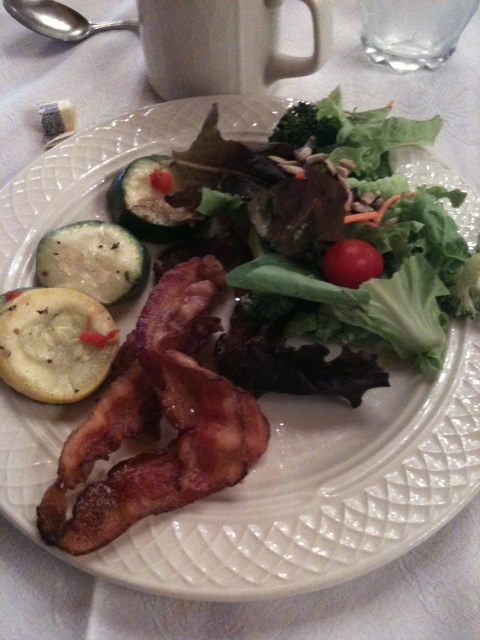 So go forth to the brunch buffet and enjoy it knowing that you are in control and you don’t have to eat six plates of bacon…even though bacon is delicious!